The holiday season is officially upon us, and we all know that means it's time to start drinking. I personally break out one very special cocktail that I only drink during this time of year. During my first year living in New York, I used to stroll around the Village buying used magazines and ogling NYU boys. But the absolute best part of that time came in the form of a bar called Shade. And this is where the Fuzzy Wuzzy was born. Combine one shot of vanilla vodka with a sweet shot of Bailey's and a splash of Goldschlager. Add a quick sprinkling of nutmeg, and you have yourself a delicious holiday cocktail. 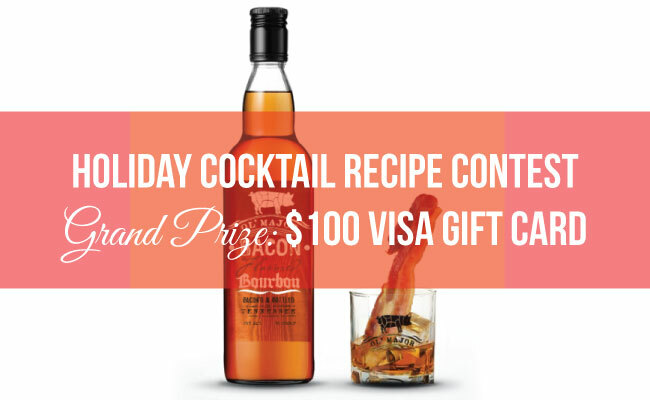 So in honor of this special time, I've teamed up with Ice Fox Vodka and Ol' Major Bacon Bourbon to hold a Holiday Cocktail Recipe Contest. Here's the scoop. Bottled by hand in an old prison on Treasure Island, this 100% corn vodka is smooth, slightly sweet and oh so hip. Triple distilled using pure Sierra Nevada Mountain water, Ice Fox Vodka has received the Double Gold Medal from Alcohol Aficianado as well as a Gold medal at the San Francisco World Spirits Competition. And the bottle is hella cool. Guys. It's Bacon. And it's Bourbon. It's like it was made for bloody marys. Using a proprietary infusion process, real bacon is pressed into the bourbon to create a magical combination of boozy bacon deliciousness. Both savory and sweet, hints of sea salt and bacon give way to a maple, bourbon finish. And of course, Ol' Major Bacon Bourbon won a gold medal at the San Francisco World Spirits Competition. Create an original holiday cocktail recipe using vodka or bourbon. Extra points if it's good for day-drinking, because well, that's what we do at The Drunken Tomato. All recipes must be received by 11:59pm PDT on Friday, December 11, 2015.